Provides 10 billion beneficial micro-organisms a day. Our dietary supplement is formulated from a strain of probiotics. These are living micro-organisms which, when ingested in sufficient quantities, are beneficial for our health. In fact, probiotics are known to form part of the body’s various microbiota. While our intestinal microbiota is better-known for its role in the body’s digestion and defences, others such as vaginal microbiota are also involved in protecting the body from external attack. The Lactobacillus rhamnosus strain selected for our supplement has been the subject of more than 800 studies examining its benefits for intestinal microbiota and vaginal flora. Because of the many studies conducted on its positive effects on intestinal microbiota, Lactobacillus rhamnosus features prominently among the wide range of probiotics available. It not only combats the development of infectious agents such as pathogenic bacteria, but also restores the balance of intestinal microbiota. It is thus widely used to treat diarrhoea, including that caused by rotaviruses and antibiotics. In addition, Lactobacillus rhamnosus reduces intestinal permeability, an effect particularly beneficial for reducing digestive problems such as those related to irritable bowel syndrome. As a result of all these effects on the digestive system. 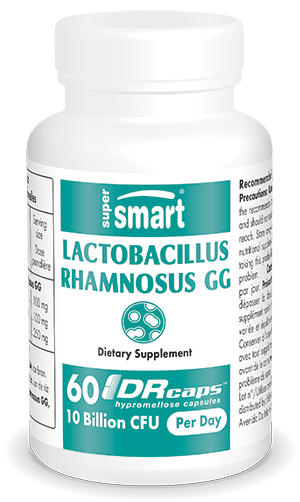 Lactobacillus rhamnosus constitutes a valuable aid to restoring and maintaining digestive comfort. Though there is greater awareness of probiotics’ effects on intestinal microbiota, certain strains have proved particularly effective at maintaining vaginal flora. One such strain is Lactobacillus rhamnosus which has been shown to be useful for treating uro-genital infections, particularly bacterial vaginosis, one of the most common vaginal bacterial infections. In order to fully capitalise on the benefits of these probiotics, our dietary supplement has been formulated from a patented strain called Lactobacillus GG, known for its resistance and stability and thus good viability over time. It is formulated in DR Caps™ for optimal absorption and bioavailability. Each capsule also contains inulin, a fructo-oligosaccharide which nourishes the bacteria and thus promotes its growth. At the recommended dose of two capsules a day, this dietary supplement can be taken on a temporary or prolonged basis, depending on your needs and the advice of your therapist. However, those with an impaired immune system or who are undergoing medical treatment are advised to consult a health professional before starting supplementation. Taking other probiotic strains may also be advisable in the case of digestive problems. The strain Lactobacillus gasseri, for example, is recommended for restoring balance to gut flora, while the strain Lactobacillus reuteri can help combat diarrhoea. Other ingredients : magnesium stearate, maltodextrin, silicon dioxide, microcrystalline cellulose. LifeinU™ Lactobacillus rhamnosus GG, Lesaffre, France.